The Art and History of Granville Redmond [1871-1935] an early California Impressionist artist! Buying & Selling Fine Granville Redmond Paintings! Granville Redmond Gallery is devoted to the art and history of Granville Redmond [1871-1935] and more! We are active buyers and sellers of Granville Redmond paintings! On this site you will find a Granville Redmond biography, partial inventory of paintings, historical information and useful links that we hope you enjoy and find useful. You may find us a valuable resource to purchase or sell Granville Redmond paintings -- you may also wish to add your name to our mailing list to be notified of new availabilities! It is interesting that Granville Redmond at the age of two and a half caught scarlet fever which eventually made him totally deaf. Attending what is now called the California School for the Deaf in Fremont, California, Granville Redmond's artistic abilities were recognized by a teacher who ecouraged his drawing skills, sculpture and pantomine. He felt his pantomime skills made him a natural for silent movies, he was eventually cast in seven Charlie Chaplin movies, one in particular was titled "A Dog's Life". 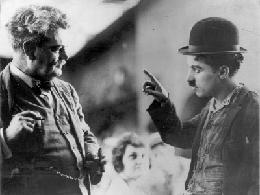 Charlie Chaplin was a lifelong patron of Redmond's art and provided his friend a painting studio on the grounds of the movie lot. Our Commitment is the preservation of the vanishing treasures of Granville Redmond's art to benefit present & future generations of collectors, museums, art historians, students and art lovers. In that regard we can be your resource tool for the conservation, research, evaluation, framing and care of your valuable painting...if you wish to sell we can find a good home for your painting, many of our buyers are always interested in knowing about new Granville Redmond paintings in the marketplace.